OH MY STINKING WORD, I LOVE THIS BOOK SO MUCH! That is exactly what I felt like when I finished For Darkness Shows the Stars. I can never decide if Persuasion or Pride and Prejudice is my favorite Jane Austen novel. It’s too hard to decide since they are both so epically made of awesome, but suffice it to say, I have a great love for Persuasion. 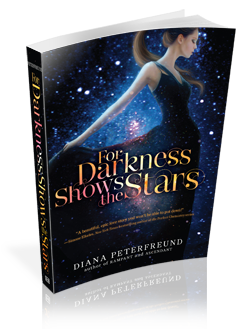 So, when I heard that For Darkness Shows the Stars was a futuristic retelling of Jane Austen’s epic awesome, I was in. Oh, I was all in…and then it took me over a year to read it. Sigh. Yes, it was inexcusable and totally my fault. The way Diana Peterfreund took this classic story with these classic characters and made them her own was absolutely exquisite. It had the beauty and tension and utter heartbreak of the original with an extra…something…that made the story stand out on its own. Elliot and Kai drew me in completely, the futuristic setting was surprisingly perfect, the imagery was totally gorgeous, and just like in the original I wanted to hit Elliot’s father and sister. Overall, whether you love or hate Jane Austen, have read all or none of her books, I highly recommend For Darkness Shows the Stars. It’s made of awesome.